This is a must try recipe for Candied Jalapenos (aka Cowboy Candy)! They are sweet and spicy! It is a canning recipe with a fridge option. Rinse jalapenos well then slice them into about 1/8-1/4 inch slices. Place in a bowl and set aside. In a medium saucepan, mix apple cider vinegar, sugar, celery seed, cayenne pepper, mustard seed, and turmeric. Bring this mixture to a rolling boil. Then immediately reduce the heat and allow it to simmer for 6 to 7 minutes. Be sure to stir it frequently. Now add the sliced jalapenos to the saucepan. Turn the heat back to high and bring it to a rolling boil. Now reduce the heat to low/medium again and allow it to simmer for about another 6 to 7 minutes. While that is simmering, put your pint canning jars and lids in the water bath canner. This is to sterilize them. After a minute or two, remove the jars and lids and place on a dish towel. 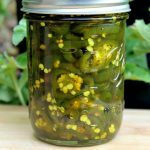 Now use a large slotted spoon to transfer the jalapenos to the canning jars. Be sure to make them as equal as you can. While regular jars will work, wide mouth jars make it easier to pack the jars. After you remove the peppers from the pot, turn the heat back to high to thicken the brine into a syrup. This should take about 5 minutes. Now distribute the hot brine syrup between the jars. You want to make sure to cover the peppers completely but allow 1/2 inch headspace. After you have the jars full, wipe the rims, then put the seal lid on and then rings. You want the rings to be finger tight. Place jars in a hot water canning bath for 12 minutes. You want to make sure you have enough water in your canner. The water should cover the jars by about two inches. After 12 minutes, remove the jars carefully and allow them to cool on a towel for about 8 to 12 hours. After cool check out seals and if everything is sealed (that is when the top center can't be pushed in) you can store in a cool place for up to one year. If you do not want to do the water bath canning, you can put in the fridge. Just follow the same steps and then apply the lids and rings allow to cool to room temperature then refrigerate. Leave in the fridge for at least two weeks before opening. Then enjoy within 10 weeks.